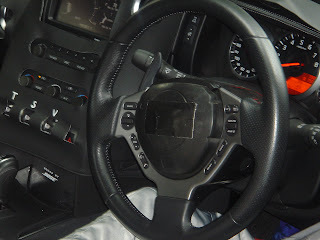 You can see the steering wheel controls for a lap timer , radio , handsfree , cruise control. Hey...since when did a GT-R have cruise control ? Lazy US market. Also notice the display in the dash - similar to the R34. I noticed large and small "gauges" on the screen. T S V . Traction control , Active Suspension , Vehicle Dynamic Control ? Usually VDC and TC are together. Tach - big side looks like it goes to 8k. Probably 7500 rpm redline. Look carefully at the tape on the wheel - it doesn't say Nissan there - it says GT -R.